TRACKED EXPRESS 24 DELIVERY! FREE NEUTRALISING MASK! 750 ML, 1 litre and three litres Available On Sale Now! The ation and ingredients. hair products. So, your order's on the way. Order cancellation. Product Warranty. 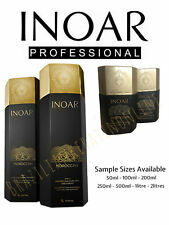 Brazilian smoothing Inoar G-hair, has been created to discipline the most rebellious hair. It transforms the hair dull and without vitality in hair smooth, silky and intensely brilliant. GHair finishing mask allows to set the keratin in the hair. Brazilian smoothing Inoar G-hair, has been created to discipline the most rebellious hair. porous appearance. It transforms the hair dull and without vitality in hair smooth, silky and intensely brilliant. Ensures smoother and healthier hair that glow. Mode of use: After washing the hair with deep cleansing shampoo, apply the mask B-Tox throughout the length of the wire. Comb to leave aligned all the hair fiber. Kit smoothing Brazilian Eternity liss Pérola. Thus, Eternity Liss, composed based on active keratin and Cysteine, which treats the hair leaving them in good health, the intensification of the natural shine of the hair and giving them a smooth effect was developed. 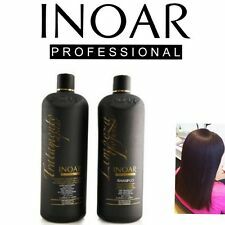 In addition, this hair straightening of INOAR takes care of the health of the hair because it replenishes the keratin, giving it more body, strength and silkiness. 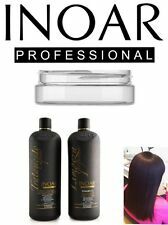 The INOAR Moroccan Straightening Kit is indicated for those who have curly and / or frizzy hair and want a smoothing of smooth, smooth hair, with balanced hydration and a deep repair in the weakest parts. Brazilian smoothing Inoar Marroquino, composed of a mixture of acids, organic, d?. jojoba oil, proteins of wheat, extract of cocoa, keratin, panthenol and white clay. Marroquino Inoar Brazilian smoothing, is composed d?. Brazilian smoothing Inoar Marroquino, composed d?. a mixture d?. d, organic acids?. jojoba oil, wheat protein, d?. extract of cocoa, keratin, panthenol and d?. white clay. For all hair types?. Marroquino Inoar Brazilian smoothing, is composed d?. A Brazilian keratin blow dry hair care set, perfect for frizzy or curly hair or hair that have been chemically treated. Conditions and protects hair, while straightening and softening. Smooths and eliminates frizz for up to four months. Brazilian smoothing Inoar Marroquino, composed d?. a mixture d?. d, organic acids?. jojoba oil, proteins of wheat, extract of cocoa, keratin, panthenol and d?. white clay. For all hair types?. Marroquino Inoar Brazilian smoothing, is composed d?. It's exclusive and revolutionary formula contains Amino System, and actives made of organic acids conjugated with 11 amino acids, combined with olive and coconut oil, providing a perfect and long lasting reduction for curly hair. Brazilian smoothing Inoar Marroquino, composed of a mixture of organic acids, jojoba oil, wheat protein, cocoa extract, panthenol keratin and white clay. Marroquino Inoar Brazilian smoothing, is composed of a mixture of organic acids, jojoba oil, wheat protein, d?. Authentic Inoar Moroccan ! Step by step instructions. This is the authentic original Inoar Moroccan. Model Moroccan. 250mi/8.4oz each bottle. Gender Unisex. Age Group Adult. 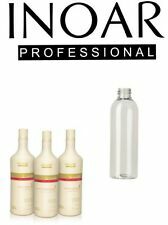 Authentic Inoar products have the Inoar logo on the bottle. Inoar Ghair. With Inoar logo on the bottle as proof of authenticity. Hair Type All Hair Types. Step by step instructions on how to use. Gender Unisex.